You can test your card skills now with the latest Single Deck Blackjack Professional Series (Standard Limit) card game from NetEnt. Just like any other game that comes from this provider, here as well, we have a beautifully designed table in front of us that offers a very realistic experience. This is a classic game and it is played with single hand per round. The objective of the game is to have a hand that has a higher value than the total of the dealer’s hand, but it cannot exceed 21, simple right? The game is very easy to play. Once you place the bets you will receive 2 cards which are face up. One of the dealer’s cards is face up and you can see it but the second card is face down and this is the thing that makes the game more interesting. You still do not know what you are playing against and you have to make a decision depending of the total of your cards. You can end your turn or you can draw more cards. If the value of the cards exceeds 21 the game is over. There are a couple of options available to you. For instance if the dealer’s card is Ace you can buy an insurance. 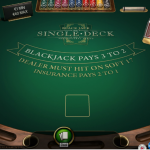 If the dealer has a Blackjack the insurance bet is paid 2:1 and the original bet is lost. If the dealer does not have a Blackjack, the insurance bet is lost. You can also split, if you have 2 cards with the same value and you can double, for which you will receive 1 card. Single Deck Blackjack Professional Series (Standard Limit) from NetEnt has everything we are looking for in a game. Great features and a nice and realistic design is all we need. If you like to try the Low Limit version of this very own game then click here.